We are now accepting sponsors for our 2019 Book Festival. Please note: We are not a registered non-profit. This is a community event organized by area authors. The organizers are not making any proceeds from sponsorship money. We will also have draw and design your own bookmarks and all about the author posters to fill out and color. 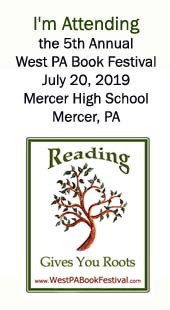 West PA Book Festival would like to thank its host Mercer Mainstreet for offering space and support during their annual farm market events. If you're in the area, be sure to stop by Saturdays from 9 am to 1 pm starting July 9th for fresh farm produce as well as artisans, readings from children's books, music, a children's festival, and more. Thank you for helping to support local literacy and local authors! Money raised will go to advertising expenses to help our event grow. I'm so excited about the 2016 WestPA Book Festival. I love the white books for kids! When I taught 4th grade, all of my students wrote and illustrated their own stories in the "white books." I have run into several of these students, who are now adults, and they still have the books they created as a student! They consider those books - "treasures!"